Kyle Burrell was born and raised in the Chattooga River country of northeast Georgia and has been seriously fly fishing, fly tying, and building custom fly rods since 1984. Kyle has an extensive resume when it comes to trout fishing. He has a Master’s Degree in Forest Resources Management with a concentration on coldwater fisheries and is a licensed U.S. Coast Guard Captain. He is an expert on trout behavior and trout stream ecosystems. His graduate thesis entitled “Seasonal Movement in Brown Trout in the Chattooga River Watershed” was published in Transactions of the American Fisheries Society in 2001. Kyle has been a U.S. Forest Service Fisheries Biologist in North Carolina and Georgia, and has worked as an Environmental Scientist in the Atlanta area. 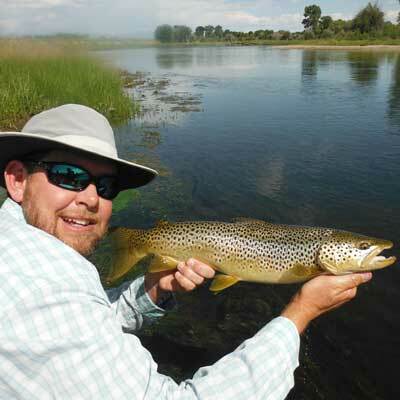 Kyle now guides full-time and divides his time between the Chattahoochee River in Atlanta, Georgia in the spring and fall, and the Green and New Fork Rivers in Pinedale, Wyoming in the summer for trophy-sized wild trout.